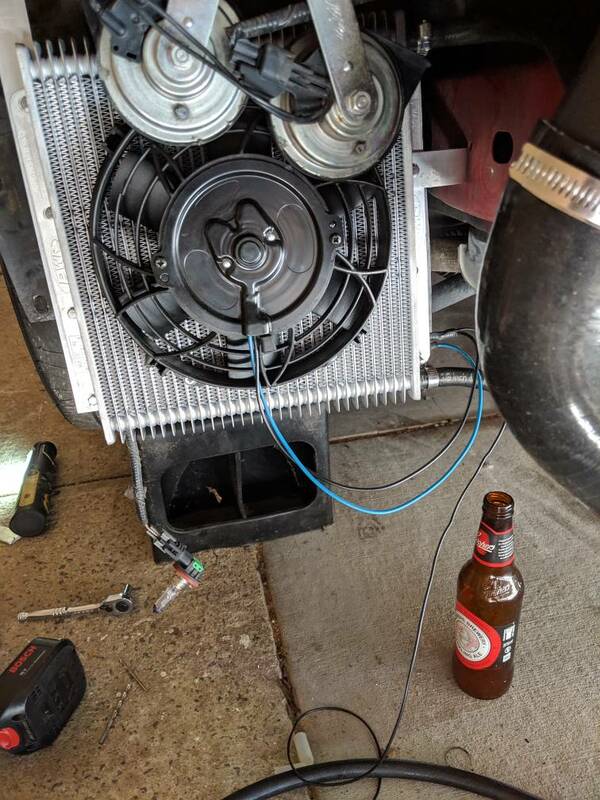 Having just serviced my ZF transmission and installed an air-to-oil transmission cooler with a fan, the following is a write up of how I approached it.Some of information out there was very scattered or hard to find, so I thought a full write up might help anyone else doing this. 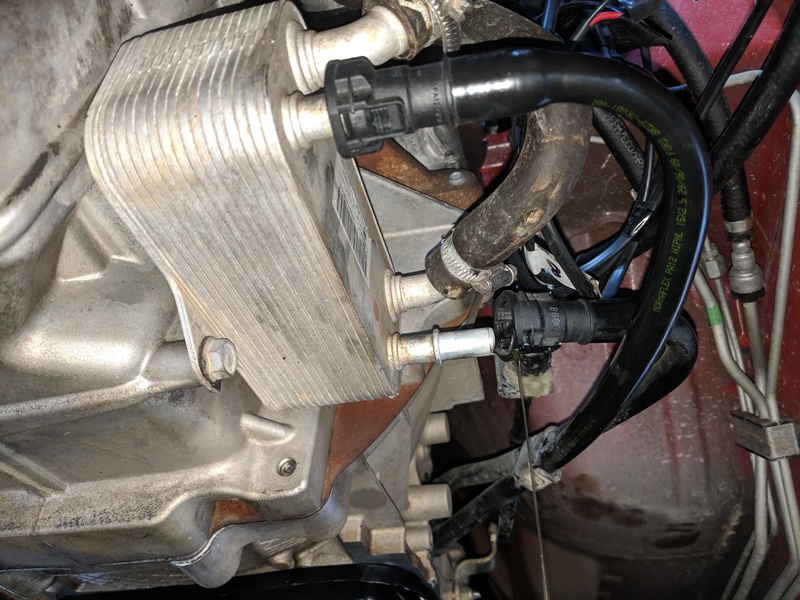 This should bring together the whole job of adding a cooler to replace the factory heat exchanger, adding a fan with a thermostatic switch to activate (plus a manual override), flushing the ZF, changing the filter and pan gasket and replacing the mechatronic sleeve. This was a first for me, so if there are things I could have done differently, feel free to point them out so someone else can avoid a mistake or save some time! 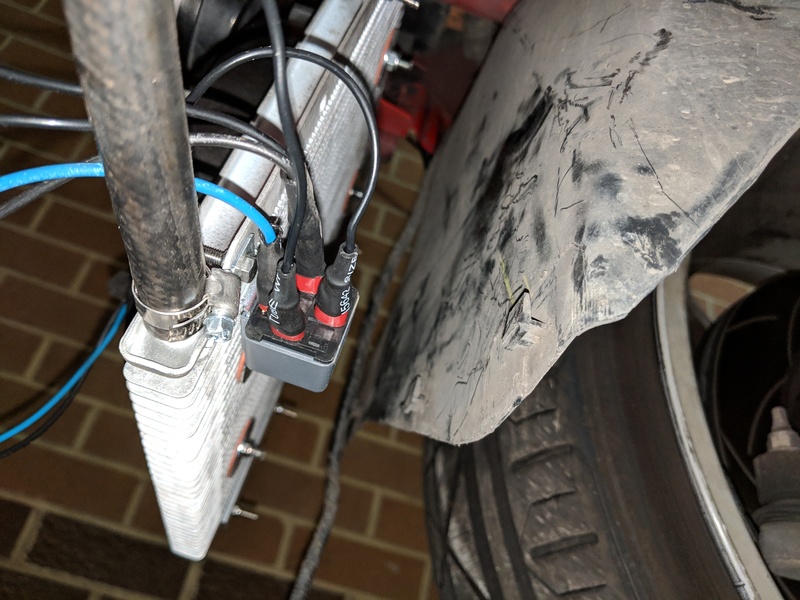 While it is a reasonable size job, I don’t feel like anything was especially difficult.If you are confident with general servicing and basic wiring, you shouldn’t have any problems!Of course though it is your transmission which is expensive if you stuff it up! I pre-prepared as much of the wiring as I could so that it was already to go when I installed the cooler.You can of course not worry about the fan, as some people do, which significantly reduces this job.In my view, there is not heaps of airflow inside the bumper and while you are stationery, your airflow is zero.I figure if you are going to the effort, you may as well go the whole box and dice.I’ve noticed that the temps stabilise nicely once the fan kicks in, so I think your box will definitely run cooler with a fan installed which should help longevity. -BA/non-ZF BF with a BTR transmission – similar deal, but you are removing existing lines from the radiator, not the ZF’s heat exchanger. A big thank you to those of you who gave me advice and responses to various questions along the way!Also to a couple of BMW videos on YouTube that helped me out with the mechatronic sleeve. 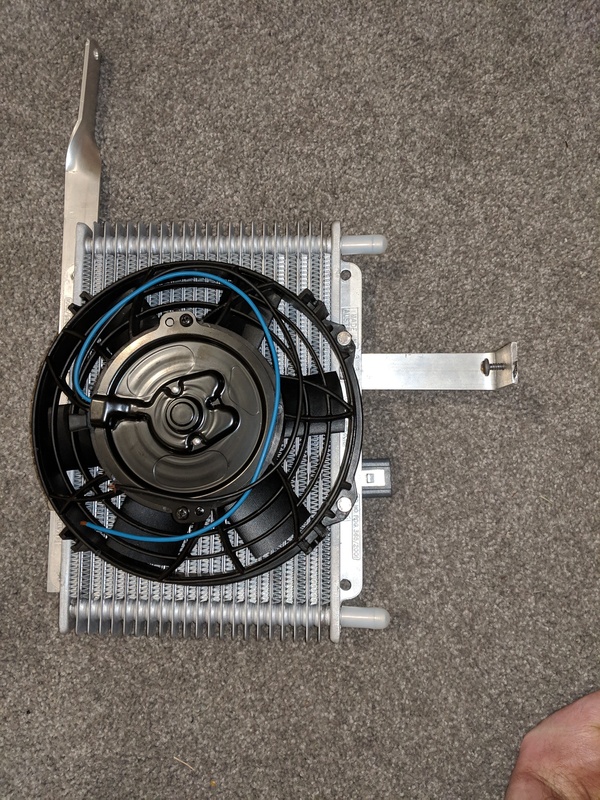 Cooler – DC698 Davies Craig transmission cooler and fan kit (you can also get a slightly bigger cooler than this which would also fit but may be harder to fit the fan to). A length of aluminium bar (2x20mm.About 600mm will be plenty) to make cooler mounting brackets. 3/8” hose – 2x 2m lengths will do it.Some comes in the kit, but not enough. 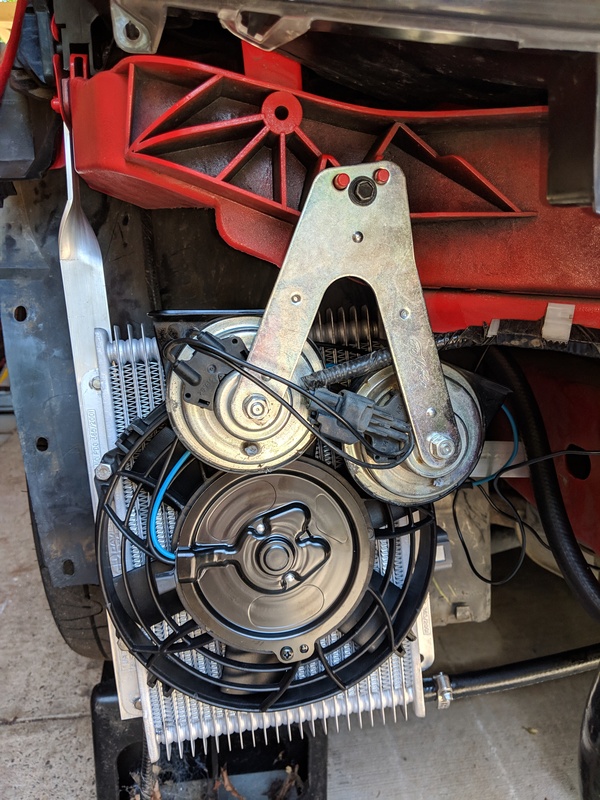 Hose clamps – I used EFI ones that don’t cut into the hose as much.4x clamps if you are not fitting a temp switch on the fan, 6x clamps if you are (some will come in the kit if you are using one, but I bought better ones). Stainless bolts, nylock buts and washers and a couple of self-tappers for attaching the cooler to the brackets you will make up. A pump for filling the transmission – the type that fits a 20L drum works perfectly. OBD2 Bluetooth tool and Torque app to read transmission temperature when getting the level right. 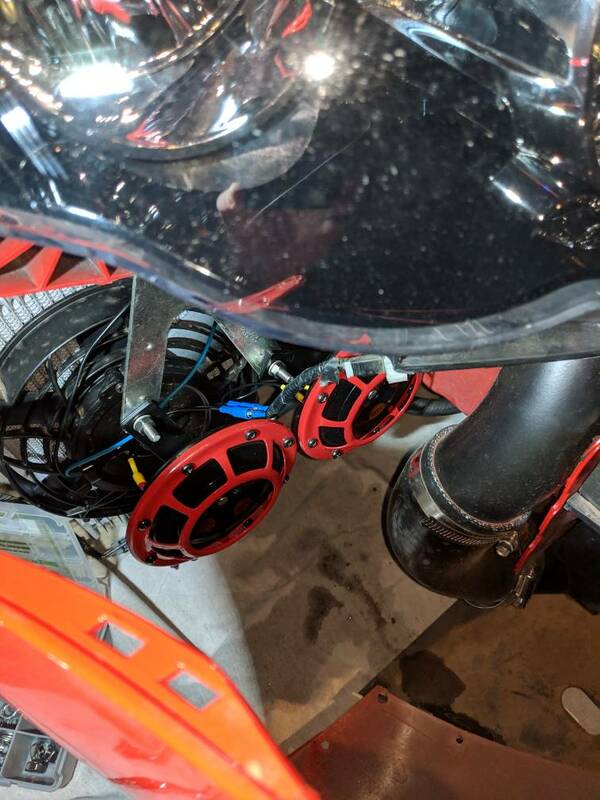 I installed the cooler in the space in front of the driver’s side front wheel, behind the horns. 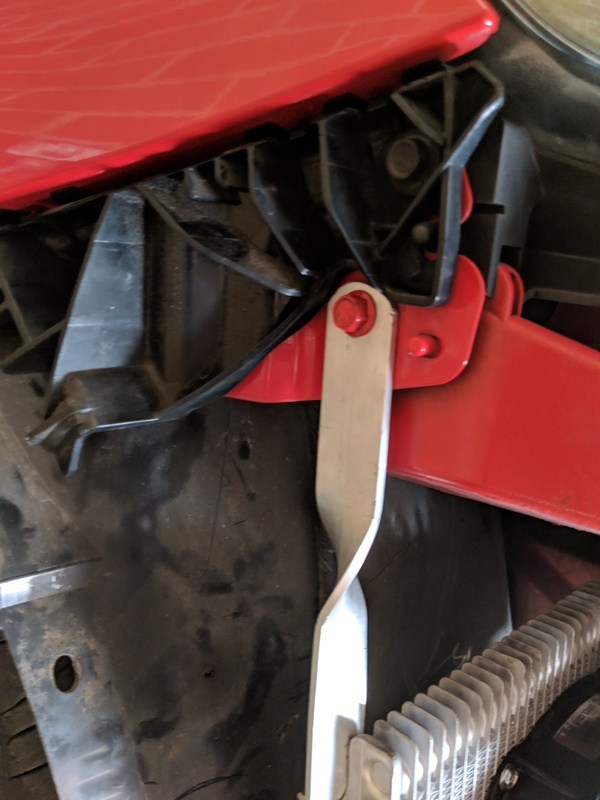 Carefully pull each corner outwards from the bumper mounts and then pull bumper forward and remove from car.Have a sheet or something ready to carefully place it on, unless like me you had already murdered the bar and are fitting a new one. You need to make up brackets to mount the cooler securely, but still have some flex.You don’t want to crack a cooler!I used the bolt under the bumper mounting bracket as my main bracket, and a right angle bracket to the chassis to stabilise it as per the picture. -Drill some holes in the aluminium bar to suit the mounting holes on your cooler. -Measure the length the bar needs to be by holding it (with cooler attached) up next to the car, then cut the bar with an angle grinder or hack saw.Round off the top corner to make it sit nicely under the bumper mount and give you some rotation for adjustment.Make sure you allow for the cooler to clear the bumper when installed. -Cut and bend aluminium bar to suit. -Re-install and add your self-tapping screw. Note I had to fiddle around with the orientation of the horns a bit as they were hitting the fan shroud. 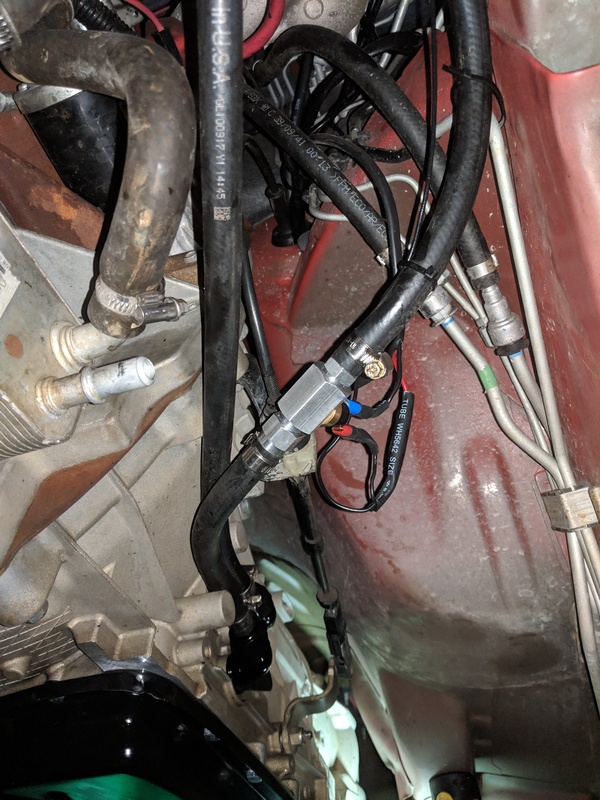 -I routed my hoses along the front K-frame cross-member (just cable-tied to the wiring loom running there – I will go back later and install p-clamps properly) making sure you are clear of the accessories belt and pulleys. -The other hose can just continue to the same location, but doesn’t need anything mounted inline. 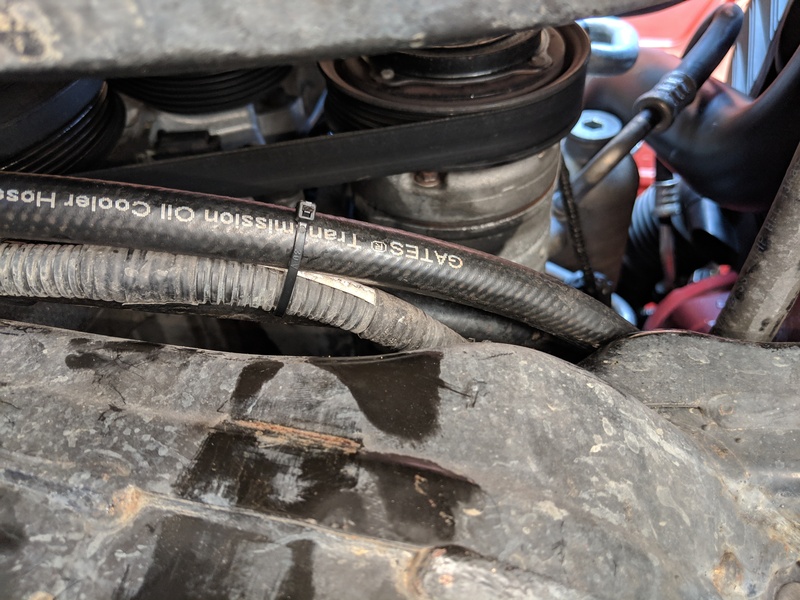 Secure the hose up out of the way and tape the hose ends if you aren’t finishing the job here – your car is still driveable but you have done the hard bit! -One wire headed off to a switch (if your switch has an indicator light you can ground back to the grounding point behind the fuse box) to be used for the manual override.I mounted my switch in the little pop-out panel in the steering column that is used for the adjustable pedals option.From the switch, head the wire through the firewall. -One wire headed to an LED (I mounted mine with my aftermarket gauges) and then on through the firewall.This wire will be for the thermo switch and the LED will tell you when the thermos switch has kicked in. 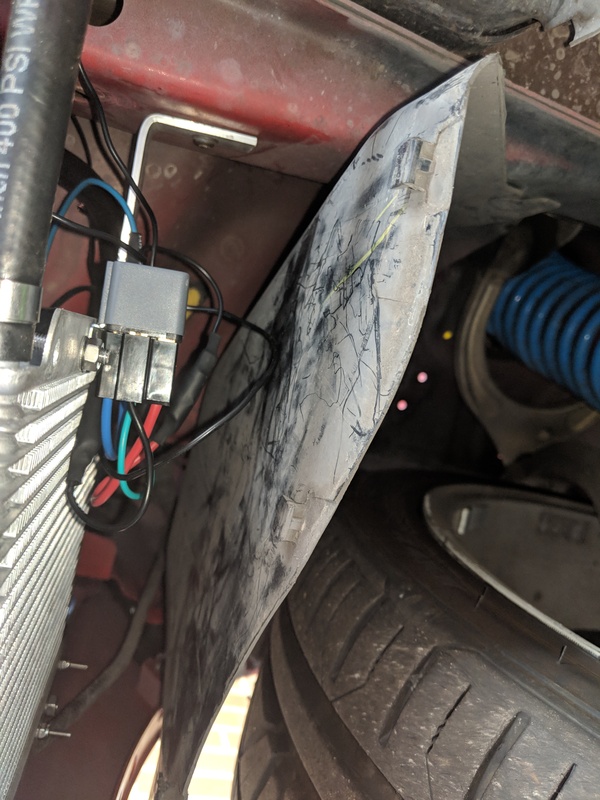 My wiring was a bit more complex than that, as I did it as part of a larger boost, wideband and oil pressure gauge install.I pinned up a Deutsch connector just inside the firewall to take all of this wiring neatly through the firewall. The rubber grommet behind the carpet in the passenger footwell is a great place to take the wiring through.It is away from the exhaust and conveniently pops out near your transmission.Just cut or drill a small hole in the rubber plug to feed your wiring through.A touch of Innox spray or similar will help feed the wires through (especially if you are feeding a rubber hose through for a boost gauge). Run your thermo switch wire to the thermo switch (you will eventually plumb this into your transmission line) and then from the thermo switch it can be soldered or crimped to your wire coming from your manual switch.You now have two switches (manual and thermos) wired in parallel and can run a single wire through to your fan location (just run the wire along the transmission lines you have added).Crimp on a spade connector and connect to the trigger terminal on your relay (or your kit may have a relay connector that you need to join to). Run power and ground from your battery to your relay (include an inline fuse on the power), ground from battery to your fan (can share with the relay’s ground) and power from your relay to your fan. At this point, it is not a bad idea to get out a multimeter or test light and confirm everything is working eg your LED, your manual switch, etc. I’ll draw up a basic wiring diagram of all this and add soon. 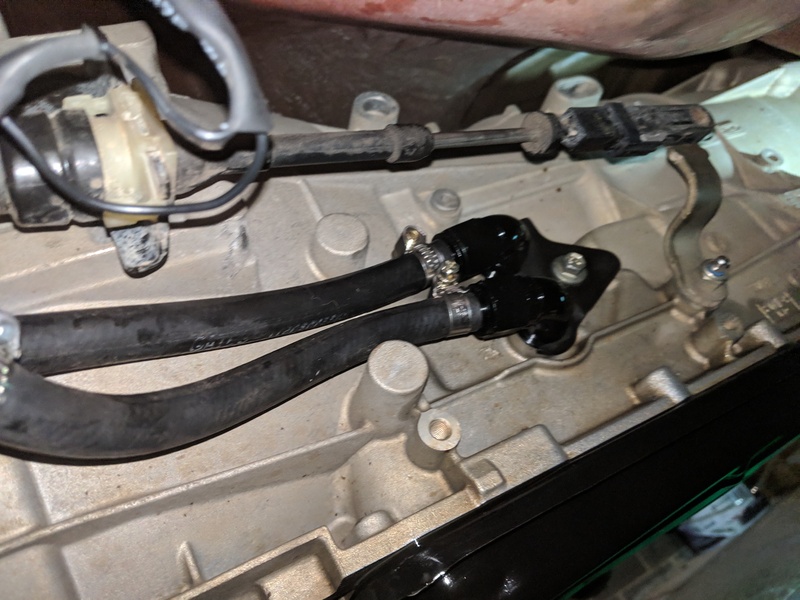 The existing cooler lines are held in place on the transmission by a bracket with a 10mm bolt.Remove this and the lines just pull straight out of the transmission.Have a drain pan ready for whatever spills out.Congratulations, you are now officially milkshake-proof! On the heat exchanger end of the lines, the fittings are push lock.You need to push them further on to the ports on the heat exchanger, squeeze the tabs on the side in, and pull off.A set of multi-grips does this nicely.If you get stuck there is nothing wrong with being rough or cutting them – it is all going in the bin anyway. You can just leave the coolant lines as is, attached to the heat exchanger, if you don’t want to lose a bunch of coolant right now.Come back later with a 1/2" male-to-male barbed fitting to connect the two coolant hoses together.I left my heat exchanger coolant lines in place as my coolant is brand new – next time I have a need to open up the cooling system I’ll sort this out and have the fitting ready to go. 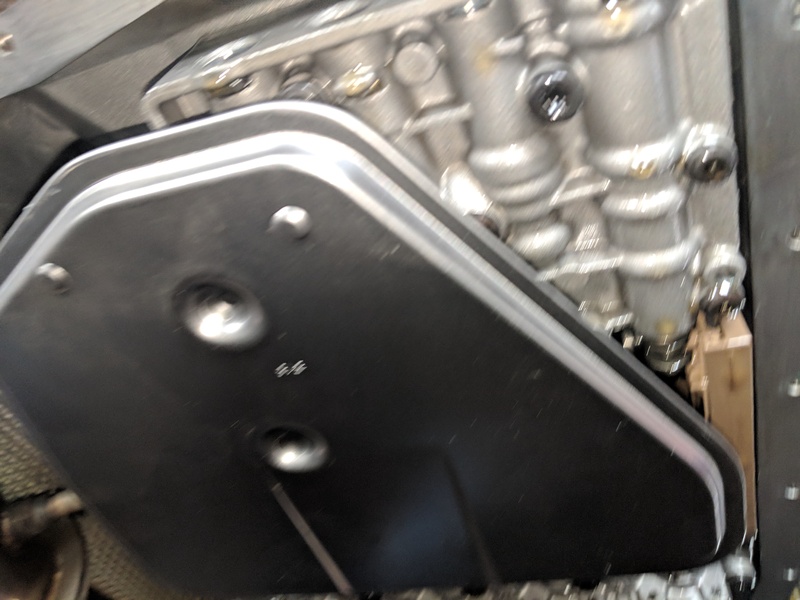 There are three bolts holding the heat exchanger to the engine block (you can see the lower one in the pic above).If you have disconnected your coolant lines, remove the bolts and remove the heat exchanger.DON’T sell it on Gumtree – put it in the bin where it belongs! 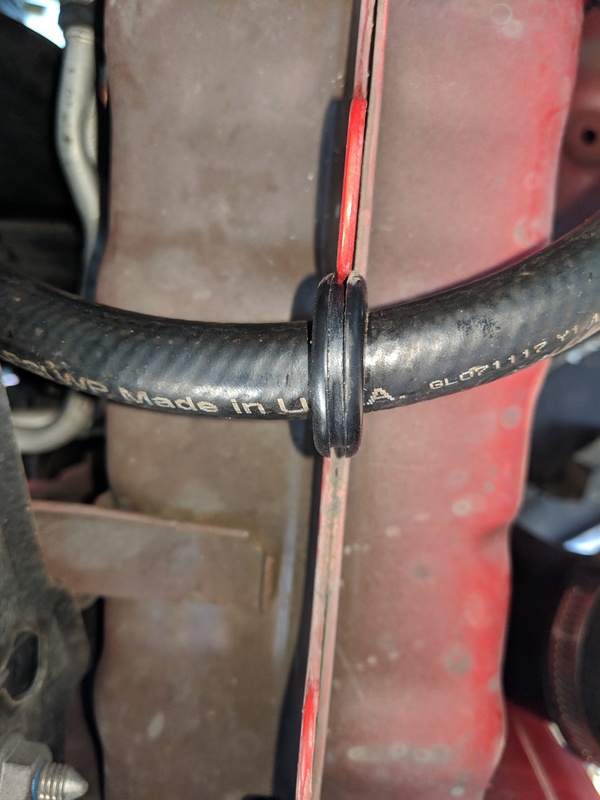 If you are leaving you coolant lines intact for now, still remove these bolts so you can tip the heat exchanger and drain the transmission fluid out of the bottom of the heat exchanger.You don’t want this coming out the ports and painting the underneath of your car every time you turn right for the next couple of weeks.Once you have tipped out as much fluid as you can, replace the bolts. Now connect your transmission to the new lines you ran earlier. -Push each line into the transmission ports.The lower port it the outlet from the transmission, so this should be the line with the thermos switch installed. 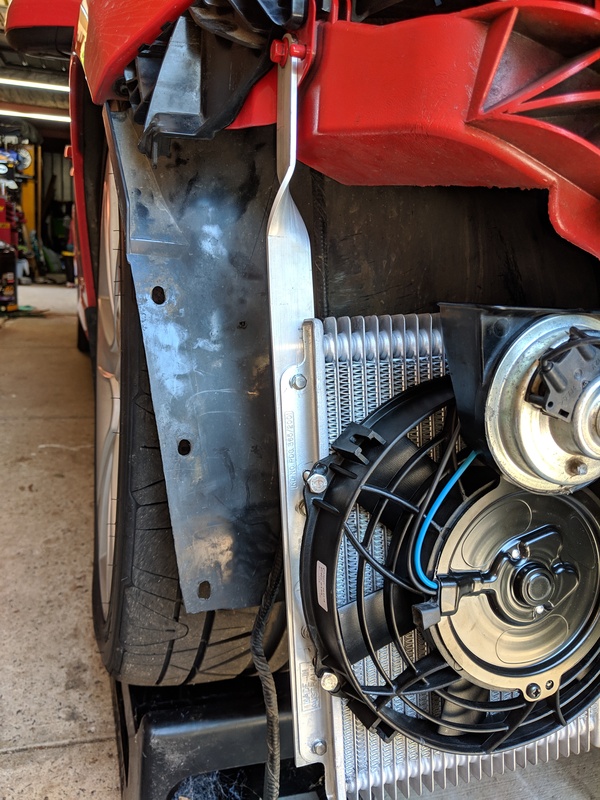 -New steel pan with a drain plug and new gasket – not essential (as I already had a steel pan) but well worth it - not just for this job but if you are planning to service the trans periodically.Once you remove the existing pan once you will understand why. -New mechatronic sleeve – the o-rings on these are prone to leaking and you need to remove the pan to replace the sleeve, so do it now. First step is to remove the fill plug on the driver’s side of the transmission, towards the back.Mine was a T50 although it sounds like some might be 8mm internal hex (Allen).Mine was ridiculously tight (ended up with a steel pipe over the handle of a breaker bar sticking out the front of the car) so make sure you can loosen this before you go dumping your transmission oil. Prepare the area by putting down a tarp and some cardboard and even have a couple of old towels on hand.It can get messy! Remove the bolts from the pan and lower the pan, tipping the fluid into a drain pan.I removed a bunch of bolts and left the corners in place, then gradually undid these and then removed the front ones so I could tip as much fluid out the front as possible.Even so, there will still be quite a bit in there when you remove the last of the bolts. Once the pan is out of the way you will see the filter on the bottom of the transmission.Pull this out too.You might find the seal on the filter gets left behind – remove this from the transmission too using a small screwdriver or a pick, being careful not to scratch the metal surface. Use a blade to scrape any left over gasket off the bottom of the transmission. 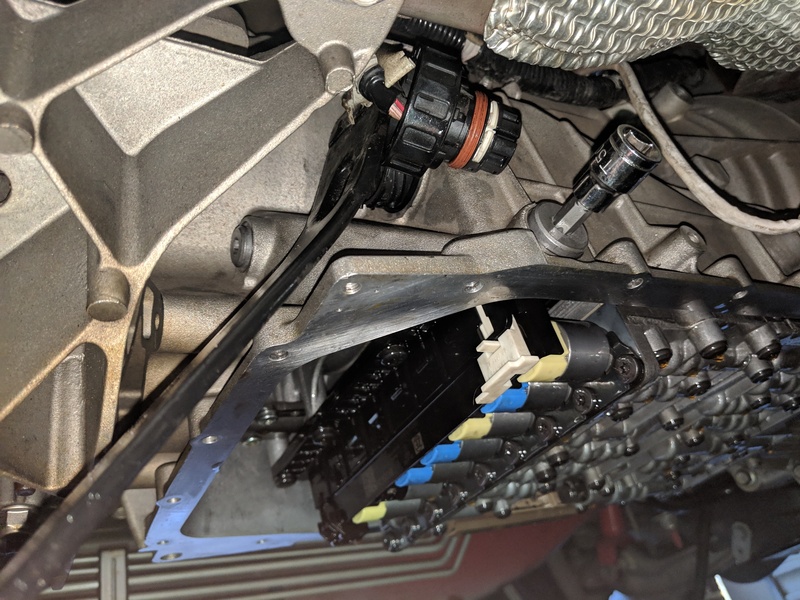 -The wiring connector is at the back of the transmission on the driver’s side.Push the locking tab up to release the wiring connector and pull it out of the way. -The sleeve the connector fitted into is what you are replacing.This is locked into place by the white locking mechanism INSIDE the transmission.I found this out on a YouTube video for a BMW ZF installation – if you didn’t know about the lock and just forced the sleeve, you could end up having a very bad day. -The sleeve slides out – it doesn’t unscrew.Grab it with multi-grips if it is stubborn and gently wriggle backwards. -Lubricate the o-rings on your new sleeve with Innox spray or a bit of fresh trans fluid to make the sleeve easier to fit. -Push the sleeve into place by hand as far as it will go.You can see that there is a cut-out on the sleeve which dictates the orientation – this points downward. -Close the locking mechanism by pushing upwards.You may need to apply some pressure to the sleeve (pushing it towards the front of the vehicle) while simultaneously closing the lock.You can do this with a pry bar with a big flat blade, or use a breaker bar against a small block of wood (slide the bar in above the trans cross-member). -Refit the wiring connector and pull the locking tab back down.Again, tabs and cut-outs mean the connector can only go in a certain way.Be gentle so you don’t wreck anything. -Place the gasket over the pan, lift the pan into position and add bolts to each corner by hand. 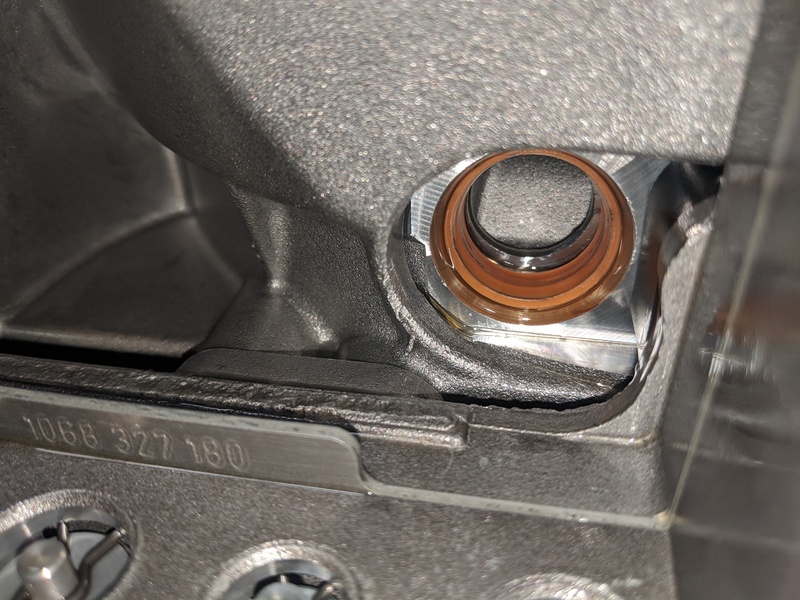 -Add all remaining bolts by hand, making sure each bolt goes through the gasket and the gasket remains neatly in place without being folder or wrinkled. -For tightening, you want to make sure you don’t warp the pan as it may leak.I think there is a recommended order, but if you alternate side to side and work your way from the middle to the ends, and just tighten a bit at a time before repeating the process, you should be fine. 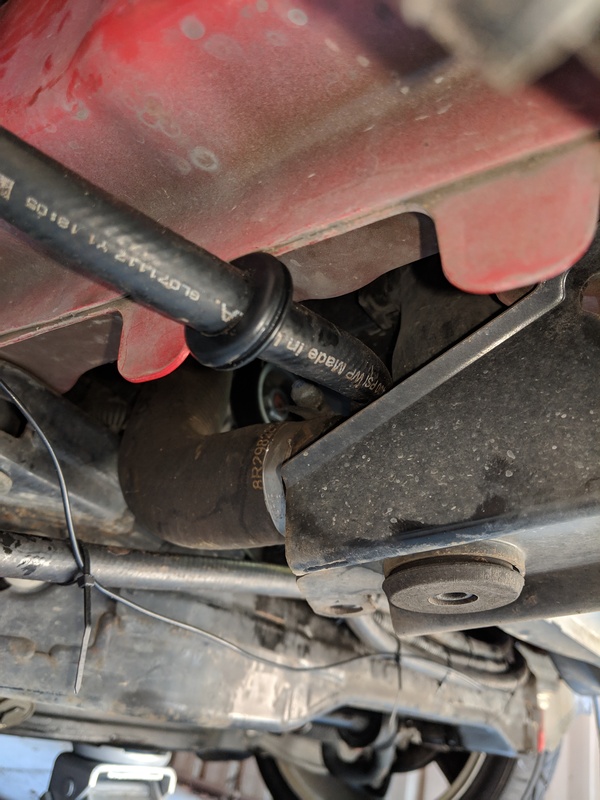 -The bolts need to be tight enough to prevent leaking but certainly not over-tightened.Stripping the threads in your transmission would also be a bad day. You are now ready to fill your transmission and start flushing. -Double check that your drain plug is in place, your pan is securely fitted and your new transmission lines well-secured. -Start the engine, lift the revs to about 1200 RPM for a few seconds, then switch off.This should pump oil through your transmission and fill up your new cooler and lines. -Remove the fill plug and top up your transmission to the fill hole again – it may take quite a bit.Replace the fill plug. -Start the engine and with your foot on the brake, place the car into reverse, neutral, drive, etc. pausing for a few seconds in each.Do this cycle a couple of times. -In a perfect world (I.e. one with a hoist) you’d run the car up to speed and let the convertor lock, etc.Safety first though and I’m not doing that on axle stands thanks very much. Personally I don’t think it is a major problem to be near enough is good enough here. -Undo your drain and fill plugs, draining the fluid.Due to the amount of fluid held in the convertor, it will now be around a 50/50 mix of old and new fluid. -Repeat the fill, start, cycle through the gears, drain process another couple of times until the fluid you are draining looks like nice, fresh fluid – this indicates you have gotten rid of the vast majority of the old stuff. -I actually stopped here after two refills due to time and drove the car for a week before doing the third and then final dump and fill.This certainly meant all of the fluid in the convertor etc was mixed through! -You need to check the level with the transmission at or very close to 35 degrees C.A heat gun or using the Torque app with a OBDII tool will do this.My Max Ellery manual says ‘transmission case should feel warm to the touch but not fully warmed up’ – pretty approximate but might do if you have no other option! 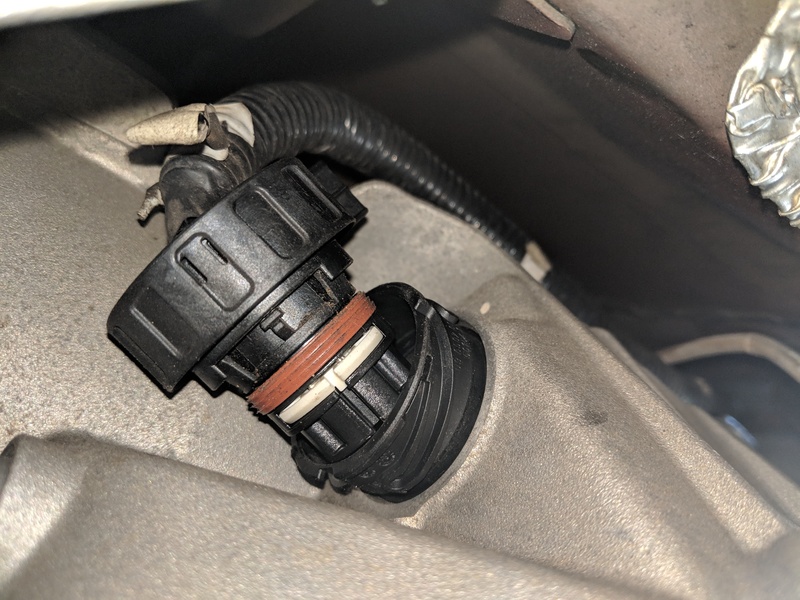 -With the car running and the fluid at 35 degrees, let the engine run and pump fluid in until fluid dribbles out the fill hole.Re-fit the fill plug. 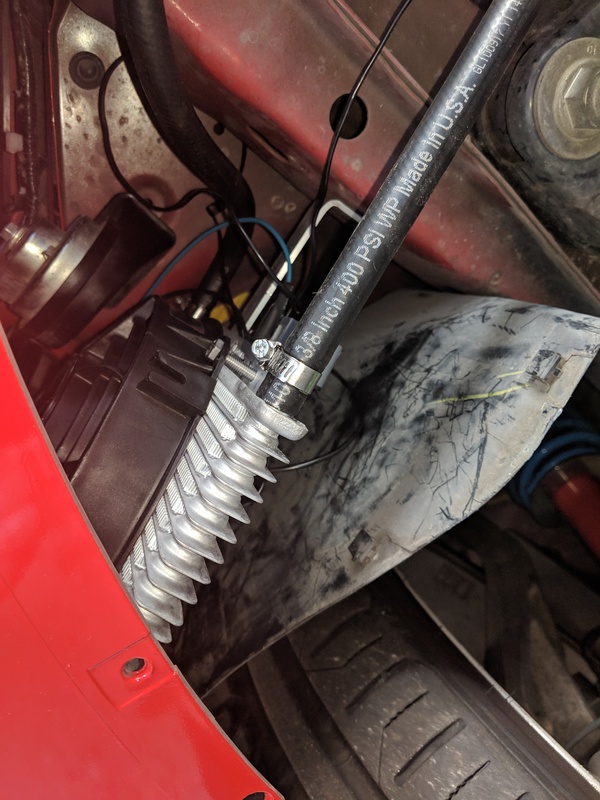 At this point you are done – clean around the drain, fill hole, etc., check everything for leaks and tighten as necessary.Refit your bumper, etc.Lower to the ground and go for a test drive.Go and get an actual chocolate milkshake rather than one made in your overflow bottle. After a week or so, get under the car again and check your connections for leaks. Thanks guys. And thanks Keith - looks like you fixed a few links! Noticed a while afterwards that some of the IMG tags dropped off when I pasted. Haha did that during the job already! Was 38 degrees most of the time. Nice. does your fan push or pull the air?? Push I guess - had an arrow that had to be pointed to the rear of the vehicle. 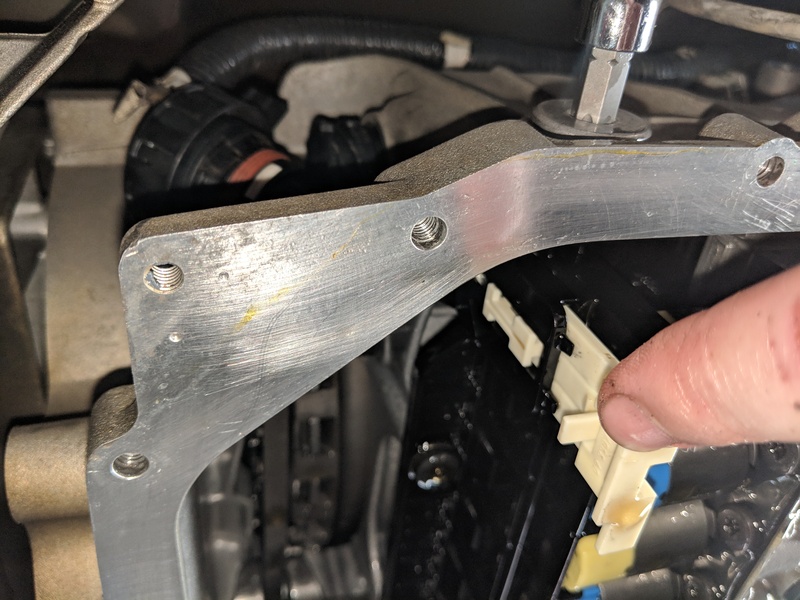 Great write up, any one had issues with the fluid spraying out of the filler hole when running after fitting a new cooler ? Ok, so DON'T do what I did with the horns! I swivelled them to clear the fan shroud and had since thought I'd left one unplugged due to the horn sounding strange. 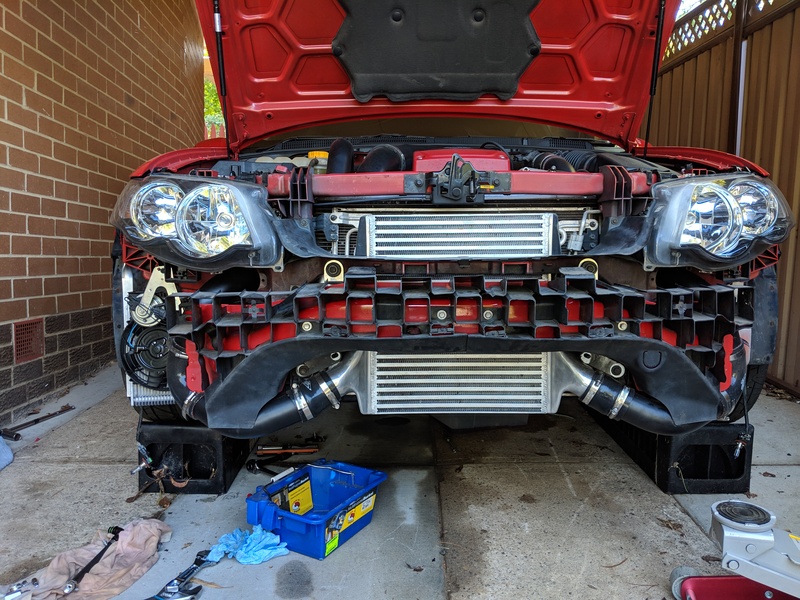 Removed the front bar last night to check and the horns were full of water! Which seems obvious to me now. Instead you could bend the horn bracket a bit to tilt the horns forward. I installed a set of new disc style horns that clear fine. Colour coded to the car too - not that you can see them! @wayno1 not sure re your issue but someone else might. Could be frothing up if it is over-filled? Did you do anything else like filter change etc? There is no need to replace the plug when you start up and run through the gears. check and the horns were full of water! Which seems obvious to me now﻿. Your horns are pointing up. They are going to get full of water. Your fan should pull the air. The fans are designed to sit behind the cooler out of the direct air flow. Yep - that's what I mean! Not sure why I didn't think that at the time. I'm not sure that's correct in this case as it is impossible to mount that way and comply with the airflow marking on the fan. "All fans are assembled to be mounted upstream (in front of radiator/condenser)." There are instructions to modify if downstream is necessary due to insufficient space. You can have it blow and not pull. No issues with that at all..
is your fan fan on a manual switch, temp switch? Both! 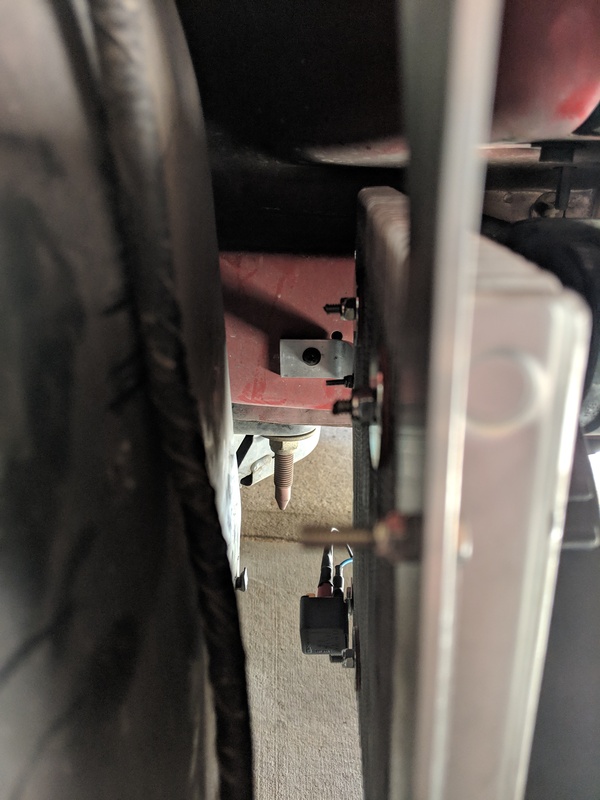 Have an 85 degree thermo switch plumbed near the transmission outlet with an LED inside the cabin, plus a manual override switch on the side of the steering column so I can force the fan on if I want. Both switches wired in parallel to the relay so either one can trigger the fan. You are correct but that's an inefficient way to mount. BUT as yours doesn't have direct air flow it doesnt matter.. I have done something similar but am getting up to 106C on the track and the car goes into limp mode until things cool down. I assume it's the trans temp that's causing it to go to limp mode. 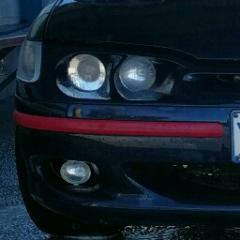 Although at one point I also got an engine oil temp code. Have you thought about putting a louvre style vent in the inner guard to help evacuate the hot air? I haven't done that and my inner guard is super hot at the track. @cat007 actually I was thinking about your post in another thread about this. I rarely get to 85 degrees, where my fan kicks in, and it sticks at that temp or below once the fan is running. That's just around town though. I wouldn't have thought 105 degrees was hot enough for limp mode. How hot do you get just commuting etc? My inner guard is always cool to the touch so haven't thought any further about trying to get heat out of there. Should have a good 90 min run through the hills coming up in a few weeks to learn a bit more about the temps. I think on a commute on a warm (over 20C) day with stop/start driving plus some 50-60km stuff, it will get to 85-90C or so, but then the fan kicks in and keeps it in check. It was just at the track there wasn't any airflow to or away from the fan/cooler so the cooler was sitting in a hot box and couldn't evacuate the hot air. With the undertray in place and all the other plastic covers etc - it's pretty sealed in there. Yeah I'm thinking the 105/106C I saw was not what caused it to go into limp mode, and it was probably the engine oil overheating that caused it. Which seems crazy that it happened so fast - 5 minutes on the track is all I would get without having to do a cool down lap or two.